The human being, animals wild as well as domestic and the birds are facing water crisis consecutively since last three years due to erratic rainfall and more or less the problem persist all over. People in general are aware about the source of water that is rain water but lacking idea about collecting and impounding it to be used in water scare situation. On the other hand there is no control over use of available water therefore, it leads to misuse. Water crisis has became an intense issue these days and hence it needs deliberately mobilizing people, devising plan with them, shouldering responsibilities to them for harvesting rain water, moderate use for domestic purposes and equitable distribution for irrigation purpose. Integrated natural resource management comprises the planned, coordinated and sustainable use of water resources, agriculture resources, grazing lands and forests.Assured water supplies results increased crop yield providing the basis for the achievement of food security and poverty reduction. In order to protect people and nature, it is imperative to step up the promotion of adaptation measures. Hence in order to achieve sustainable development, water shed management has to be considered an integral part of adaptation to climate change. Watershed treatments have been carried out in 11000 ha of land under support of NABARD, Agakhan Foundation, Caring Friends, SRTT and DST projects benefiting over 5500 farmers. Due to the land treatment work water retention capacity of treated land has been enhanced tremendously. Eighteen villages have been covered under this activity through which cotton crop production has been reached to four quintals which is double than the earlier. Integrated water resource management will continue to be an adaptation strategy for people living with rainfall variability, both for domestic supply and to enhance crop, livestock and other forms of agriculture. As the organization is situated in drought prone area of Maharashtra, it has been constructing rain water harvesting structures and mobilizing village communities to work for natural resource conservation. Farm pits have been constructed at the slope of the farm land of individual farmer. Phad Irrigation and Doha models are the location specific structures constructed at places suitable for developing such structures. The effects are visible in terms of recharging of wells and aquifers, increased bio-mass productivity and significant increase in agriculture production, reduction in women’s drudgery. Due to high fodder availability, villagers have also benefited from selling milk products through an informal dairy arrangement. The structures developed under support of Axis Bank Foundation project, Jamsetji Tata Trust, Navajbai Ratan Tata Trust and Caring Friends are detailed below. Total 300 numbers of Doha Models have been developed in distress areas of seven districts of Vidharbha and Marathwada benefitting 4280 numbers of farmers by transforming 10700 acres of rain-fed agriculture land into irrigation land. Total 252 numbers of Phad Systems have been developed in five districts of Vidharbha covering 11718 acres of dry-land that brought under irrigation and benefitting 3906 farming families. Total 511 numbers of recharge pits have been constructed at the farms of same numbers of farmers in Yavatmal district through which 1278 acres of dry-land could be given protective irrigation especially for cotton, pigeon-pea and soybean crops. Depth of the recharge pit is nine feet. Two percent out of total farmers have further sunken the pit to be developed as well that struck water. The harvested rain water coupled with spring water has been used for protective irrigation. 316 numbers of Bodi Phad structures have been developed through which 948 households could be benefitted by bringing 3792 acres of dry land agriculture under irrigation. This activity has specially been focused on rice belt in Gadchiroli district which is Naxal afflicted area. Traditionally, ‘Pata’ method of vegetable cultivation to meet the nutritional needs of the family was adopted on a large scale by the farmers and it was actually in the domain of the women. In this method, various crops comprising vegetables, pulses and crops of other values were used to be sown together in three rows in the farm. With the adoption of monoculture with the advent of green revolution, this practice was stopped to make room for so called more remunerative cash crops. Dilasa has now reinstated this traditional practice and promoted farmers to sow various kinds of vegetables. This has enabled availability of legumes to the farming families for self consumption in order to get better healthy food comprising of vagaries of nutritional elements. As a result of our efforts, more than 3 lakhs of farmers adopted the pata method of cultivation. Various crops like Pearl millet, Maize, Sorghum, Black gram, Green gram, Lady’s finger, Guar, Cow pea were planted together in successive rows. 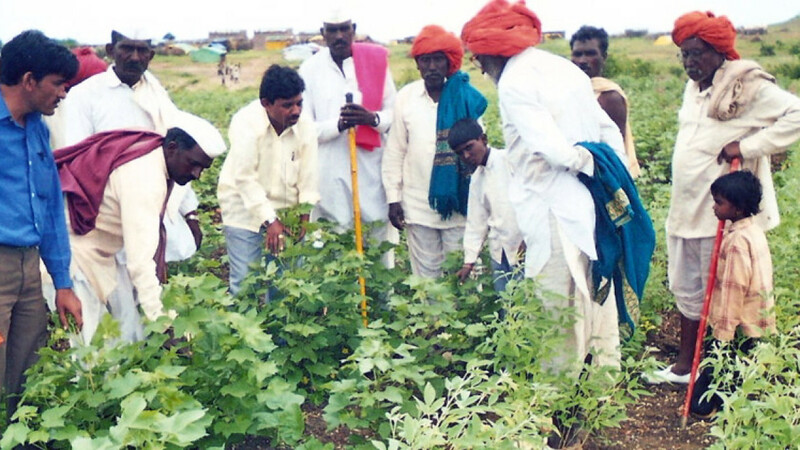 The IPM techniques were imparted to the farmers in 10 villages of Ghatanji and Zari blocks of Yavatmal district. The techniques of agriculture practices have been changed in the green revolution in which hybrid seeds, chemical fertilizers and insecticides have been promoted. Unbalanced use of chemical fertilizers, insecticides is being made in the lust of more production. This has helped in deterioration of health of soil and gradually becoming infertile.Following techniques have been assimilated by farmers for improving crop productivity. The PKV has recommended use of N.P.K.